My veggie garden did very well this year. Usually by the middle of July the searing sun has wiped out anything that struggled to remain during the hot summer months. But even though it’s been hot this year my garden has provided garden deliciousness well into the fall months. Yea! One of the fall feast-or-famine goodies from the garden is cantaloupe. Now I didn’t plant cantaloupe this year, the vines volunteered from my compost. But I let them grow to become a living mulch for the rest of the garden. RancherMan eats only a modest amount of fresh cantaloupe & although I love it, how’s a girl to eat that much by herself?? I wondered if there was something I could do with all the excess cantaloupe – as it turns out, there is! Typically my go-to recipe source is allrecipes.com. 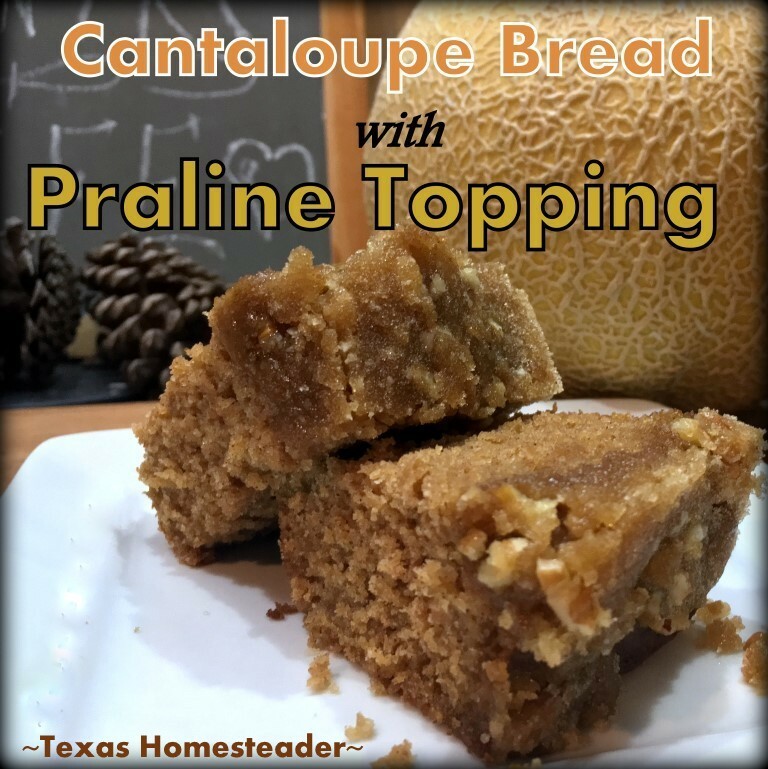 I searched their site for some ideas of what to do with excess fresh cantaloupe and found a recipe for Cantaloupe Bread With Praline Glaze. Hummmm… Although the thought of cantaloupe bread didn’t initially sound delicious to me, how different could it be from the delicious sweet-treat bread made from zucchini squash? Maybe I should just check out the ingredients. The seasonings look good, and I have all the ingredients in my pantry. Let’s give it a try! I’d already harvested several fresh cantaloupe so I peeled one up and dropped the peeled pieces into my *Ninja blender and blended them until it was smooth. The recipe called for 2 cups of puree so I measured it out for my recipe. Then I plopped the cantaloupe puree into my KitchenAid mixer. I wanted to substitute 1/2 of the oil with applesauce. So into the KitchenAid with the cantaloupe puree I added the eggs, applesauce, sugar, vanilla and cantaloupe & mixed it all up. That bowl was then set aside. In another bowl I blended flour, salt baking soda, baking powder, cinnamon & ginger. Then I mixed the contents of the two bowls together to make my batter. I poured it into two lightly greased & floured glass loaf pans & placed them into the preheated oven. I’d lowered the recipe’s temperature requirement by 25 degrees due to the fact that I’m baking in a glass pan (as I always do). Then I baked the loaves for about an hour. When it was done I brought out the two loaves of cantaloupe bread (breathes deeply) Oh yeah, this might work after all! While the bread was still hot I whipped up the glaze of melted butter, brown sugar and chopped pecans. The pecan praline glaze was added to the tops of my hot loaves of bread. Although the flavor of the praline glaze was absolutely amazing, I wasn’t happy with the texture of it. The praline glaze cooled to a crumbly texture that fell from the top when I tried to cut & serve the bread. So I may tweak that part in the future to add more butter or less brown sugar. A sweet friend recommended I add 1/4 cup milk or cream to the butter and sugar and pour over the bread while warm. Or I may eliminate the topping completely, who knows??! But I was very pleased with the bread itself! Here’s the recipe as I made it – give it a try. Mix together pour into 2 greased loaf pans & bake @ 325 degrees (315 degrees for glass pans) for 1 hr. Preheat oven to 325 degrees F (315 for glass pan). Lightly grease and flour two 9x5 inch loaf pans. In a large bowl, beat together eggs, vegetable oil/applesauce, sugar, vanilla and cantaloupe. In a separate bowl, sift together flour, salt, baking soda, baking powder, cinnamon and ginger. Stir flour mixture into cantaloupe mixture; stir to combine. Pour batter into prepared pans. As the bread is cooling make the pecan praline topping. Combine melted butter and brown sugar. Microwave for 3 minutes, stirring at 1 minute intervals; mix in pecans. Pour praline sauce over hot bread. Then let cool for 1 hour before serving. So, I made this for the melon festival cooking contest this weekend. Now to make another batch, apparently it was really good. I halved the brown sugar, doubled the butter and it is amazing. Will let you know how it goes. Also, cantaloupe sorbet is great too. I’ve never heard of cantaloupe bread. I must give this one a try. Pinning. Canteloupe bread?? I never would have thought of this!! I bet this is amazing! Thanks for sharing on the What’s for Dinner link up! Got to try this. It looks so good and the praline topping should just add to the pleasure. I am visiting from the Blog Hop at Oakhill Homestead. Shared on Pinterest! Thanks for linking up at share the wealth Sunday! Looks great! Thanks for linking up at #SustainableSundays! Oh my gosh what an idea and it looks wonderful! – Pinned! Thank you for sharing with at the To Grandma’s House we go Wednesday link party! Hope to see you there again tomorrow! Cantaloupe in bread. What an interesting idea! Thanks for sharing on the What’s for Dinner link up and don’t forget to leave a comment at the party – Next week’s features that also leave a comment get pinned, yummed and tweeted! When I saw your link on the blog hop I had to check it out. I’ve never heard of cantaloupe bread. I’m going to pin it for the future when I might have cantaloupe I need to use. I could have tried it just a few weeks ago, but not now. Darn. Thanks for sharing! Well this is a first! 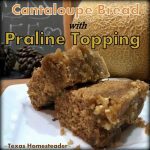 I have never thought of cantaloupe for making bread! I do love the fruit, so I am very excited to try it! Oh this looks delicious, I have never heard of cantaloupe bread, now I want to try it!! I love them fresh as is, so I can imagine that this bread must be amazing! Cantaloupe what a great idea. I opened the post when I saw praline I need a new topping recipe, but now I am going to make the cantaloupe bread as well. Pinning. Wow! I would have never thought of cantaloupe! I love it when someone thinks outside of the box. We didn’t have much of a garden this year, but are hoping to next year. i will pin this for the future. Thanks for sharing! This looks really good. I love cantaloup, but my husband doesn’t. Did your husband like the bread? If he did maybe my husband would like it too.